With 80 announced acquisitions since 2009, Microsoft is a constant force in the tech M&A market. 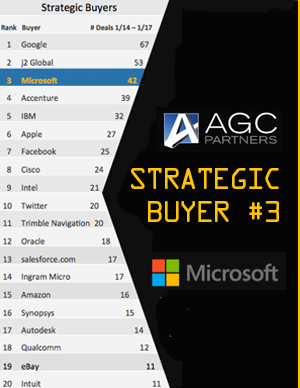 More recently, with 42 deals announced since 2014, Microsoft ranks as the 3rd most active acquirer among U.S. listed tech companies. Earlier this month, in its role as sole financial advisor, AGC Partners announced the sale of Simplygon to Microsoft. With Simplygon, the premier developer of automatic 3-D optimization solutions, Microsoft accelerates its recently announced “3D For Everyone” vision. This transaction exemplifies Microsoft’s recent strategy of making focused acquisitions that fit a broad technology vision.